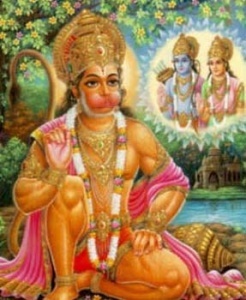 The manifestation of Hanumanji took place in the Hindi month of Chaitra, in the bright half of the month known as Shukla Paksha and on the full moon day known as Purnima. Hanuman is considered to be the eleventh incarnation of Lord Shiva and is a symbolization of strength, devotion, courage, knowledge and divinity. With his might, he aided Shri Raam in conquering the evil forces present within the world and regaining Sita Maa from the demonic individual named Ravana. Hanuman teaches us how to be great devotees of the Lord and how to serve Him. He also teaches us how we can enable ourselves to overcome all obstacles by reciting the Lord’s name. He teaches us about diplomacy and proper speech among many other things. It has been outline in the Hanuman Chalisa that by reciting the name of Hanuman, all evil is quickly removed. I surrender to Hanuman, the messenger of Lord Rama, whose speed is as swift as the mind and as swift as the wind. Who has controlled his sense organs and is the most intellegent among the intelligent ones; who is the son of vayu and the chief of the monkey tribe. I salute the son of the Wind God (Hanuman), the leader of the monkeys and the messenger of Rama, whose strength in matchless, whose body is like a hill of gold, who burns up the forest of asuras (demons) like a jungle fire, who towers among the spiritually illumined ones, and who is a treasure-house of all virtues. Knowing myself to be ignorant, I urge you, O Hanuman, the son of Paavan (Wind God)! O Lord! Bestow on me strength, wisdom and knowledge, taking away all my miseries and blemishes.